On the evening of October 9, 1893, at a prayer-meeting of the High Street Methodist Church in Binghamton, New York, Samuel Stanley rose to address the congregation. The reason? The purchase of a bicycle by Mrs Burrows, a widow and active worker in the church. Stanley, warming to his subject, denounced cycling as unladylike, unchristian, and a disgrace to the church, and the pastor, Reverend John Bradshaw, sided with him on the issue. 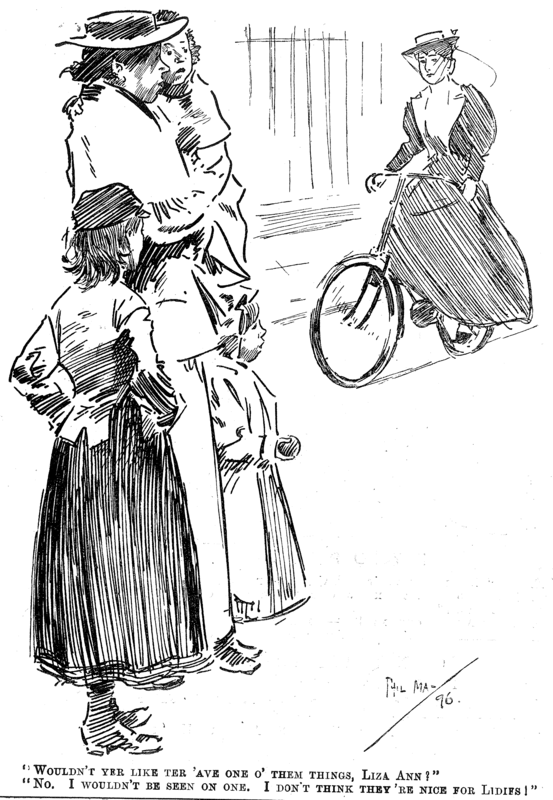 “The bicycle,” opined the moral guardians, “is the devil’s advocate agent morally and physically.” Calling on all “true women and clergymen” to support them, they denounced cycling by women as “indecent and vulgar,” and for good measure demanded that “married women should not resort to riding the wheel unless they wish to prevent motherhood.” In Britain the satirical magazine, Punch, captured negative attitudes towards women cyclists in gentler style in its 1896 issue. With such attitudes prevalent in contemporary society the dress reform movement in America stalled. In 1854 Elizabeth Cady Stanton, a fellow reformer of Amelia Bloomer, wrote to Susan B. Anthony to advise her to return to traditional dress because the “cup of ridicule is greater than you can bear.” Bloomer herself abandoned ‘freedom dress’ in 1859 and the National Dress Reform Association, founded in 1856, disbanded in 1865 amid concerns that negative attention on dress reform would hamper other reform efforts such as temperance and suffrage. 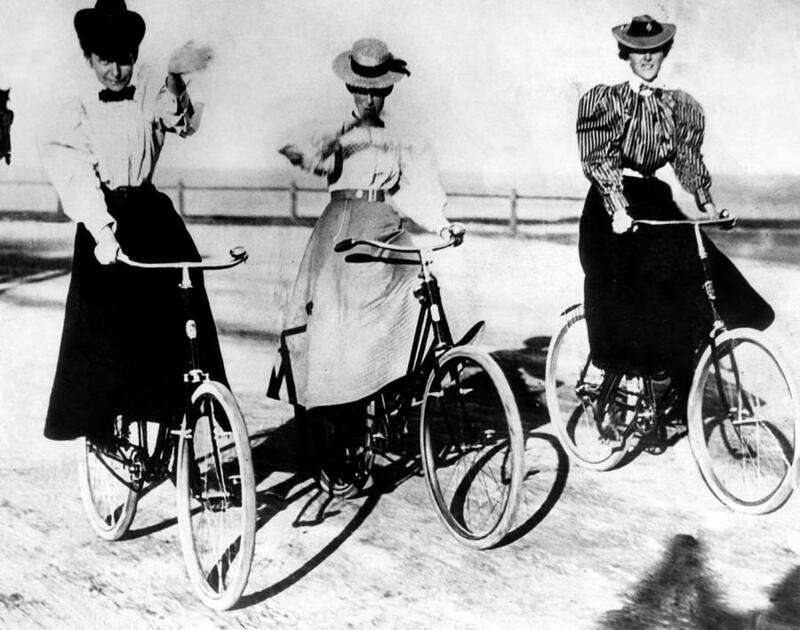 The new sport of cycling and its adoption by women was to bring the issue of dress back into the public arena. The early ordinaries or penny-farthings were largely unsuited to women, given the restrictions of their dress which made mounting and riding near impossible. The refinement of the tricycle in the 1870’s offered women a solution with a machine that allowed them to ride safely and with propriety in normal dress. 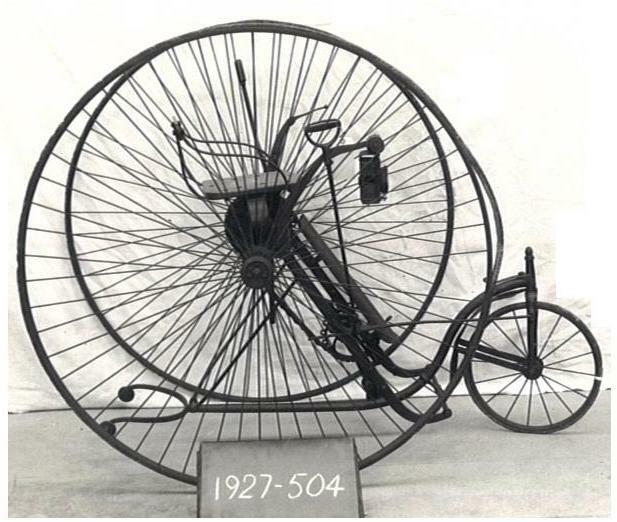 In Britain Queen Victoria ordered two Salvo Sociable’s from Coventry manufacturer James Starley giving a valuable endorsement to both the machine and the acceptability of women cyclists. 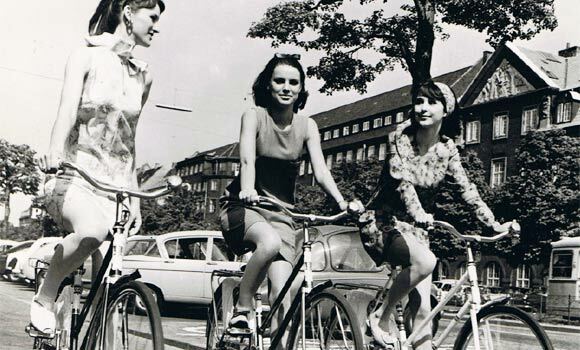 The popularity of cycling among women reinvigorated the debate on women’s clothing. Deviation from normal standards of dress was considered unacceptable yet cycling demonstrated the unsuitability of such modes of dress for physical activity. It was restrictive, heavy, and with its varying levels of drapery, depending on the vagaries of fashion, could also be a danger when it snagged on the working parts of a riders mount. 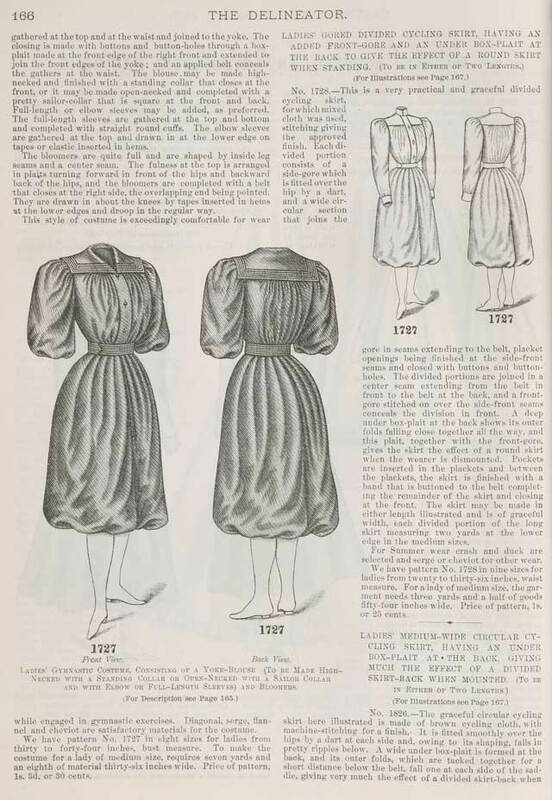 In 1881 the Rational Dress Society was founded in London which aimed to “promote the adoption according to individual taste and convenience of a style of dress based upon considerations of health, comfort, and beauty, and to deprecate constant changes of fashion which cannot be recommended on any of these grounds.” The Society’s president and co-founder, Lady Florence Harberton, was herself a keen cyclist and an advocate of exercise for women. Recognizing the restrictive nature of women’s clothes she advocated the wearing of a divided skirt over a pair of bloomers or other under trousers. A further development in bicycle design was to give added impetus to the dress reform movement. John Kemp Starley’s 1885 second design for the Rover bicycle gave the world the first commercially successful ‘safety’ bicycle and revolutionized the cycling industry. 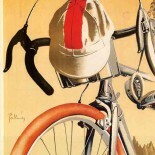 Between 1890 and 1900 the number of bicycle manufacturing firms in America rose from 27 to 312, with a corresponding growth in the production of accessories, including clothing. 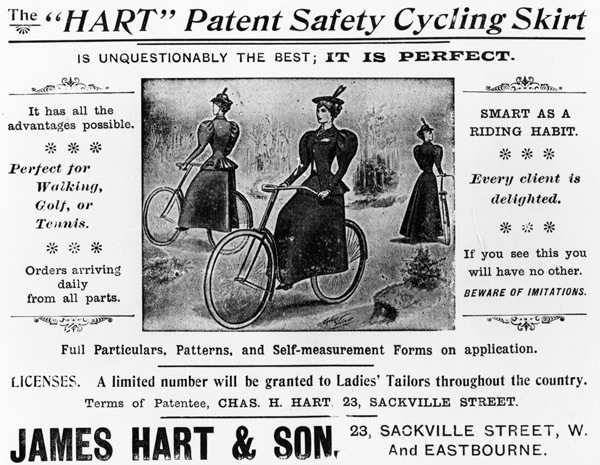 For women the safety bicycle further demonstrated the lack of fit between existing acceptable clothing and the sport of cycling. With its horizontal cross-bar the safety was unsuited to the voluminous floor-length skirts dictated by contemporary tastes and fashions, highlighting the clear need for an alternative mode of dress. 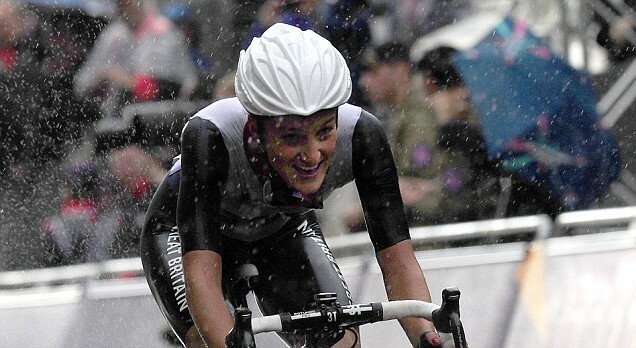 Reports in the press draw attention to the strength of the reaction to women in cycling dress within society. In 1895 the Freeland Tribune, under the headline “The Pneu-Matic Woman” reported on a broken engagement when the fiancée of a young man appeared in front of him in a pair of bloomers. Outraged by this the man ordered his fiancée to dismount and to return indoors to change into skirts or the “marriage would not take place as he drew the line at bloomers on a bike.” The young lady, “a “pneu” woman in every sense” promptly drew off her diamond ring and handed it to the man with the observation that she would not discard bloomers for him or anyone else. In San Franscisco Mrs Annie Kirk sued her dentist, W. A. Atwood, in 1897 when he refused to examine her teeth after she arrived at his office on her bicycle wearing bloomers. The dentist apparently fearing that maids and matrons might flee if they came upon him treating a woman dressed in the offending apparell. In Britain reaction was equally strong. In 1894 the landlady of an inn near Epsom in Surrey popular with cyclists seeking refreshment refused entry to two young ladies who arrived in knickerbockers commenting that “There are ladies and gentlemen who would be shocked at you.” The landlady offered the ladies skirts to wear but they refused and rode away. In October 1898 Lady Harberton made headlines when she was refused service in the coffee-room of the Hautboy Hotel by the landlady, Mrs Martha Sprague, because she was wearing rational dress. Harberton, insisting she be served in the coffee-room as any member of the Cyclists’ Touring Club, as per the existing agreement between the Club and the hotel, was instead directed to the common-bar, where she found only working men who were drinking and smoking. Objecting to this, Harberton left the premises. The Cyclists’ Touring Club took Harberton’s case up, bringing an action against Mrs Sprague in April 1899 on the grounds that she had entered into an agreement to receive and entertain Club members as ordinary coffee-room customers, and that innkeepers, who were obliged by law to provide refreshment, could not choose their guests or decline them service on the basis of dress. In her defence Mrs Sprague reminded the court that she had not refused service, but had directed Lady Harberton to another room, informing the court that in the 13 years she had held her licence at the Hautboy she had never admitted ladies in rational dress to the coffee-room unless they had brought skirts with them. In summing-up the Chairman of the court reminded the jury that the issue they should address was not the clothing worn by Harberton but whether service had been refused and whether the common-bar was a decent and respectable room in which refreshment might be offered to a guest. After briefly deliberating, the jury found itself in favour of Mrs Sprague. Women in rational dress also drew the attentions of the police. 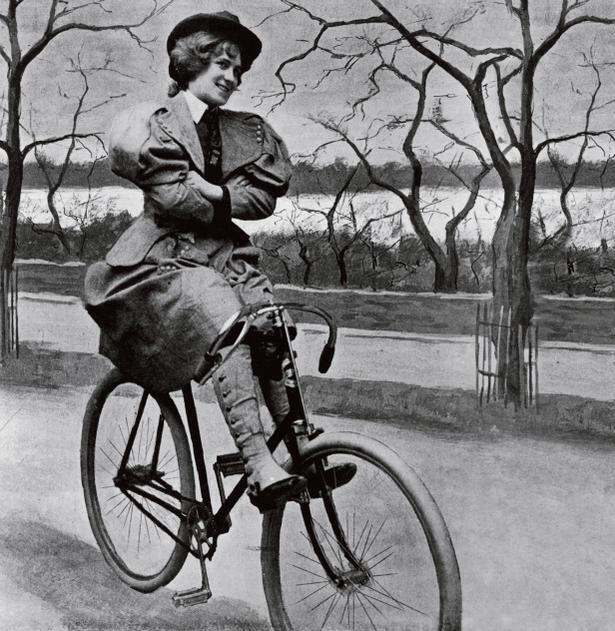 In Victoria, British Columbia, Ethel Delmont, “an enthusiastic wheel woman,” gained notoriety when she wore bloomers during a bicycle ride in March 1895, earning herself a police visit in which she was informed that any repetition of her performance would result in a police summons on the charge of causing a disturbance on the public street. In July 1895 Hattie Strage was arrested by Chicago police for disorderly conduct when she was encountered riding down Dearborn Street in a costume of black tights and a flesh-coloured sweater. “When arraigned before Justice Wallace the offending garments were laid on his honor’s desk and he promptly imposed a fine of $25.” If bloomers and tights were beyond the pale, actual male attire was even more so. In 1898 Maggie White of New York was arrested and held overnight at the West Fifty-Fourth Street Police Court after Bicycle Policeman Conneally had spotted her cycling on the Boulevard dressed in trousers, a stiff shirt, cutaway coat, and with her hair tucked away under a man’s hat. Luckily for Miss White the magistrate thought that a night in the cells had been sufficient punishment and she was discharged. Men also organized themselves in opposition to bloomers, typified by the formation of a club in Edmeston, Connecticut, whose members pledged “to refrain from associating with all young ladies who adopt the bloomer cycling costume” and to “the use of all honourable means to render such costumes unpopular in the community where I reside.” In Birmingham, Alabama, a group of young men reacted in a particularly vile manner to discourage bloomers when they hired “the biggest, fattest, most ungainly negress they could find” and set her to riding through the streets dressed in bright blue bloomers, yellow stockings, and a red sweater. Sadly this appeal to the prejudices of the time was successful as white female cyclists replaced their bloomers with skirts when they next appeared on the streets of Birmingham. While objectionable to modern audiences this last points to the key issue that lay at the heart of women’s cycling apparel. While cycling required clothing that would conform to the material demands of the bicycle, women required clothing that would not earn them censure for its dissimilarity to existing women’s dress. 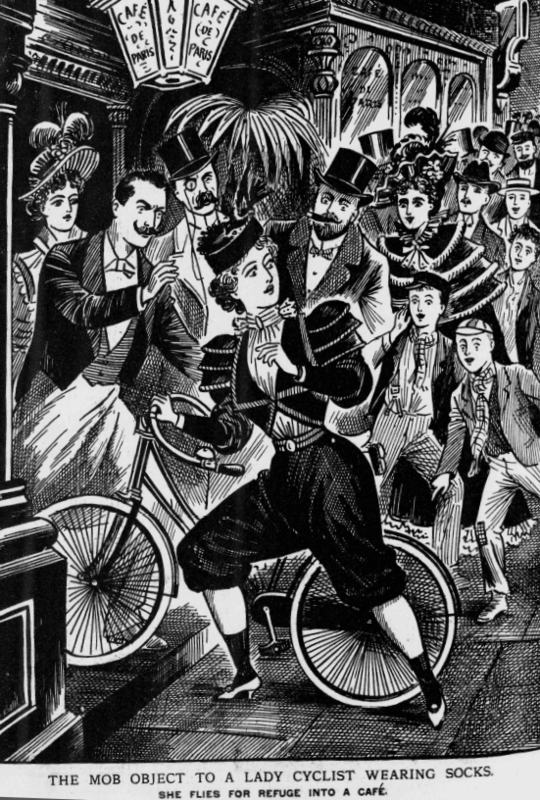 The introduction of the drop-frame safety bicycle in the late 1880’s offered many women an opportunity to enjoy cycling without resorting to bloomers, knickerbockers, or any other dreaded bifurcated garment. 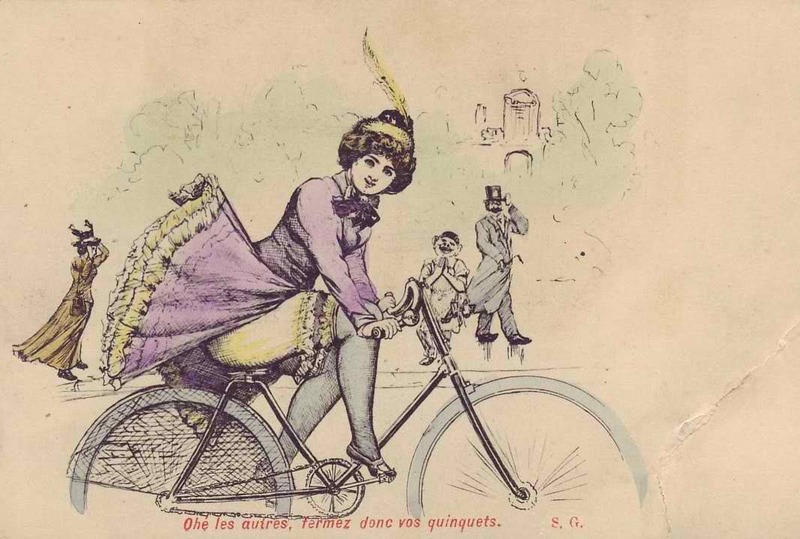 Whilst such bicycles made riding in skirts possible, contemporary fashions continued to favour women’s clothing that was ill suited to the activity. While the dress reform societies and their supporters argued passionately in favour of bloomers many thousands of other women wanted cycling clothing that met the functional needs of riding a bicycle whilst retaining a style that fulfilled contemporary notions of style and femininity. 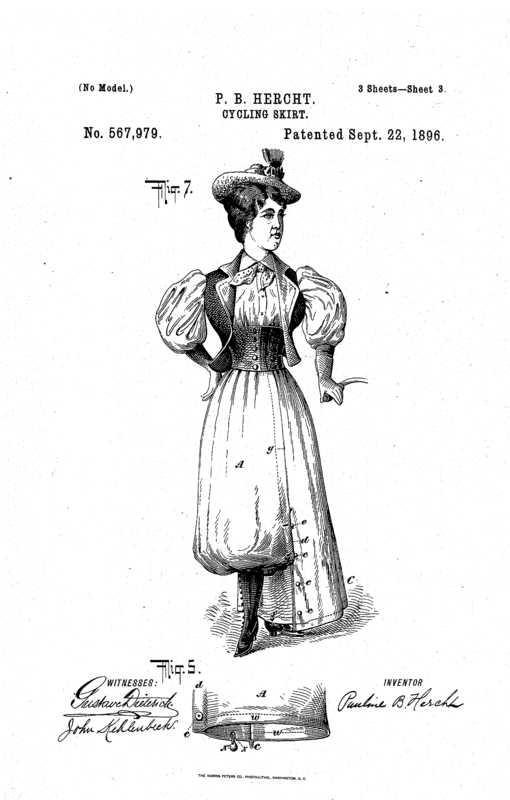 Through newspapers, magazines, club newsletters, and pattern circulars women carried out a debate on cycling dress in which they sought clothing that signalled functionality, femininity, and respectability. In an age when off-the-peg clothing was the exception rather the norm many women were competent seamstresses and dressmakers. Women cyclists began to design their own clothes, sharing these with friends and, through the pages of magazines, with a wider audience. Mail-order pattern producers, such as the Delineator, provided a range of patterns for cycling clothing, including bloomers, knickerbockers, and skirts, divided or otherwise. Manufacturers of bicycles also contributed to the discussion. After all, they had a vested interest in promoting women’s cycling as it potentially doubled the market they could sell to. 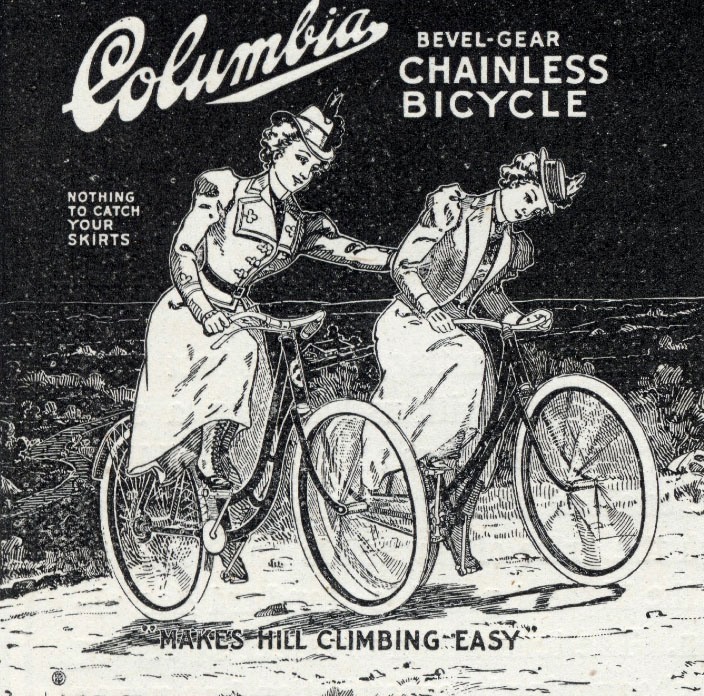 In 1895 the Pope Manufacturing Company, makers of the popular Columbia brand of bicycles, issued a set of six paper dolls that were included in the Delineator. Each doll portrayed a cycling costume designed by leading dress reformers. 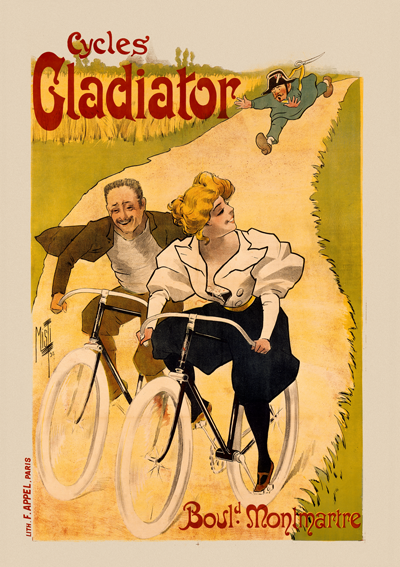 Pope was also live to the issue in its own advertising, with its first advertisement featuring women in bloomers appearing in 1894, and advertising of the time featured women in all manner of styles of dress presumably deemed suitable for cycling. Where the defenders of traditional dress and the more passionate advocators of dress reform dictated their preferred mode of dress as the right one, the reality was that women were free to choose from a variety of dress styles according to their individual preferences and notions of respectability and femininity. As Miss F. J. Erskine, author of Lady Cycling: What to Wear & How to Ride, reminded her readers environment dictated what was suitable to wear. The requirements for cycling in the town and the country were different. While artistically cut skirts and puff-sleeve blouses might be advisable on a dry Summer day in Battersea Park, such attire did not meet the needs of a long touring ride through the countryside. Knickerbockers, she argued, were essential in cycling. Skirts should be turned up a good six or eight inches and a woollen-cased corset would “keep the figure from going all abroad.” Most importantly “Wool above, wool below, wool all over” was the “hygienic rule for cycling.” Her American contemporary, Maria E. Ward, reminded her readers in Bicycling for Ladies, that “All seasons of the year permit of cycling; the bicyclist therefore has opportunity for much variety in dress.” Like Erskine she advocated knickerbockers; skirts were optional according to individual preference. Both were more concerned with the functionality and fit of the clothing rather than the outward appearance. Attitudes to the dress of women cyclists were slow to change however, and it was the First World War, rather than changing social mores that perhaps had the biggest impact on women’s clothing. The creation of the Woman’s Land Army in 1917 put a quarter of a million women into farming work in Britain. For practical reasons many of the Land Girls, as they were dubbed, adopted male modes of dress helping to establish trousers as an acceptable garment for women in specific circumstances. 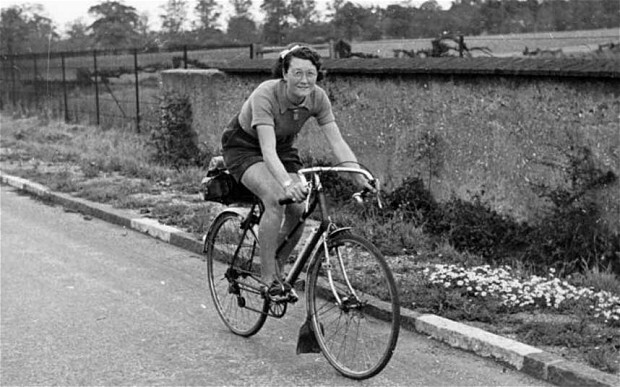 Kenward’s views were perhaps not representative of the majority by 1934 but they demonstrate that negative attitudes towards women cyclists and their mode of dress persisted long after the outrage at the scandal of the nineteenth century rational dress movement had quietened down. And it should be remembered that Kenward’s views were shared by women, as a letter from Molly Hunt, organizer of a rally of the West Kent Association CTC, to the Sussex Agricultural Express in June 1934 attests. Not only were shorts unbecoming on most feminine figures they also caused offence to otherwise well disposed people. Flannel trousers were dismissed as hideous, with Hunt expressing her pleasure that they were only adopted by a minority. Instead of either of these undesirable garments Hunt recommended that women cyclists should wear the newly introduced divided skirt over shorts. Ironically this was effectively the same solution proposed by one Florence Wallace Pomeroy, Lady Harberton, when she had founded the Rational Dress Society in 1881. The Second World War again saw women enter into spheres of employment that were traditionally regarded as male. The post-war decades saw significant changes in attitudes to women’s dress in all spheres of public life. Hemlines have risen, fallen, and risen and fallen again as fashions have changed and attitudes towards women, in much of the world at least, are very different than they were in Nineteenth century Europe and North America. Today’s female cyclist has a range of cycling appropriate clothing to choose from, whether designed for competitive sport, long-distance riding, or simply getting quickly from A to B as part of the daily routine. 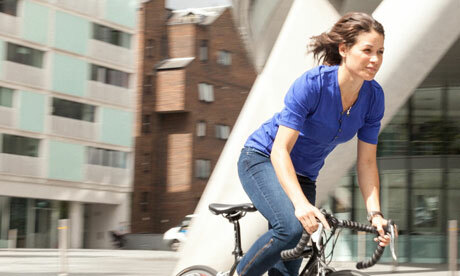 We should not exaggerate the impact of cycling on women’s dress, however. 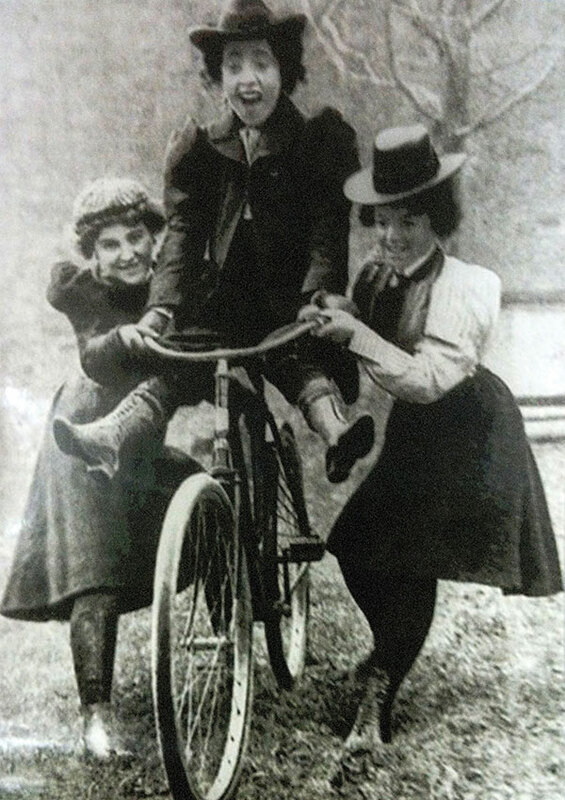 Though contemporary commentators focused on the debate over rational dress, the majority of women cyclists in the late Nineteenth and early Twentieth centuries chose to wear clothing that resembled fashionable dress, tweaked here and there for greater comfort and functionality. Rather than revolutionizing women’s clothing cycling should be set against a wider background of societal change, one element in the growing emancipation of women and their wider participation in many sports, each of which required functional modes of dress that differed from the norms of contemporary day-to-day fashionable clothing. “Maidens with a disregard for convention” by William Gordan Davis, 1895. 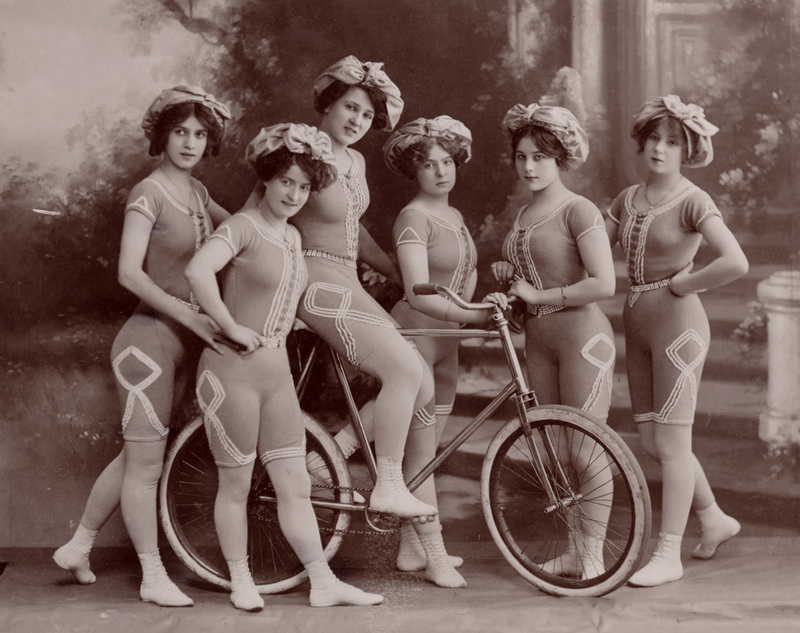 The Kaufmann Troupe of trick cyclists looking very modern in their one piece uniforms, circa 1900. “Mrs. 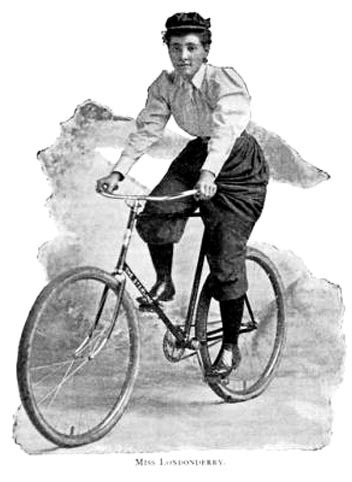 Burrows and her bicycle,” Sporting Life, October 14, 1893. Punch 100, February 1, 1896, 59. Joseph S. Bishop, “Social and Economic Influence of the Bicycle,” Forum 21 (August 1896): 683. Christine Neejer, “Cycling and Women’s Rights in the Suffragette Press,” Master’s Thesis, University of Louisville, Louisville KY, May 2011, 57. London Standard, May 27, 1881, 5. W. H. Fenton, “A Medical View of Cycling for Ladies,” Nineteenth Century 39 (May 1896): 800. Sue Macy, Wheels of Change: How Women Rode the Bicycle to Freedom (With a Few Flat Tyres Along the Way (Washington, DC: National Geographic Society, 2011), 43. 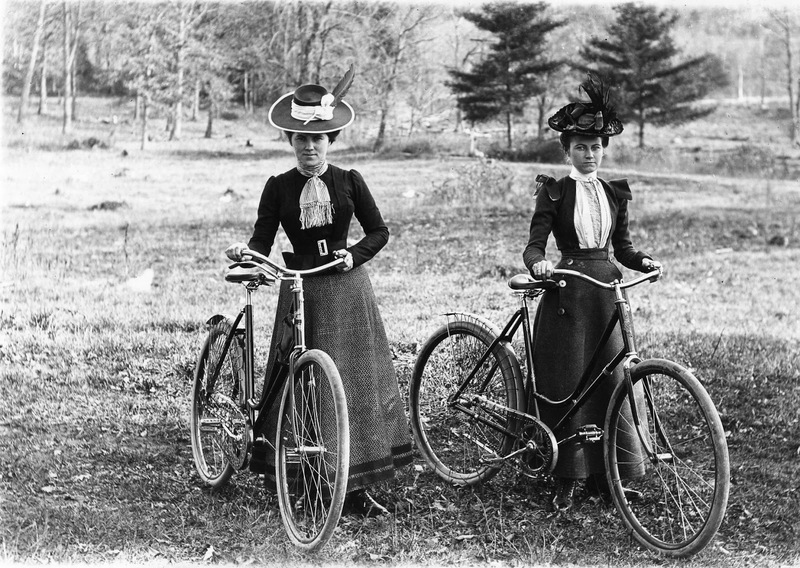 “Women Cyclists,” Cheltenham Looker-On, February 11, 1896, 35-36. “Bicycling Costumes,” Harper’s Bazaar, March 14, 1896, 29. “The Pneu-Matic Woman,” Freeland Tribune, Freeland, PA, September 2, 1895. “Making war on bloomers,” San Francisco Call, San Francisco, CA, August 31, 1987. “Inspired by the devil,” The Madisonian, Virginia City, MT, October 12, 1895. “Against the craze,” Arizona Republican, Phoenix, AZ, June 22, 1895. “Women cyclists refused hospitality,” Aberdeen Evening Express, June 8, 1894. “Hotels and “rational costume”,” The Standard, April 6, 1899. “No bloomers there,” Brooklyn Eagle, Brooklyn, NY, March 25, 1895. The Evening Times, July 19, 1895. “Girl bicyclist in trouble,” New York Times, July 02, 1898. “New woman’s garb,” The Sun, New York, September 1, 1895. Maria E. Ward, Bicycling for Ladies: The Common Sense of Bicycling (New York: Brentano’s, 1896), 93. “Compulsory bloomers,” Gloucestershire Echo, May 9, 1899. “Dress and drink for cyclists,” Lancashire Evening Post, August 4, 1900. “Women cyclists: Mere man suggest an “admirable” costume,” Western Morning News, July 11, 1934, 7. Molly Hunt, “Women cyclists’ dress, letter to the editor,” Sussex Agricultural Express, June 22, 1934, 10. You really researched for this blog post! Thx for the photos on women’s cycling, clothing that coincided with women’s emancipation movement in UK, North America. Thanks Jean. Glad you enjoyed it. Araron, I’m also a librarian (engineering, law) by formal training and career-wise. So I really meant it in my compliments to you. Many of my readers will know about my interest in cycling and professional racing. 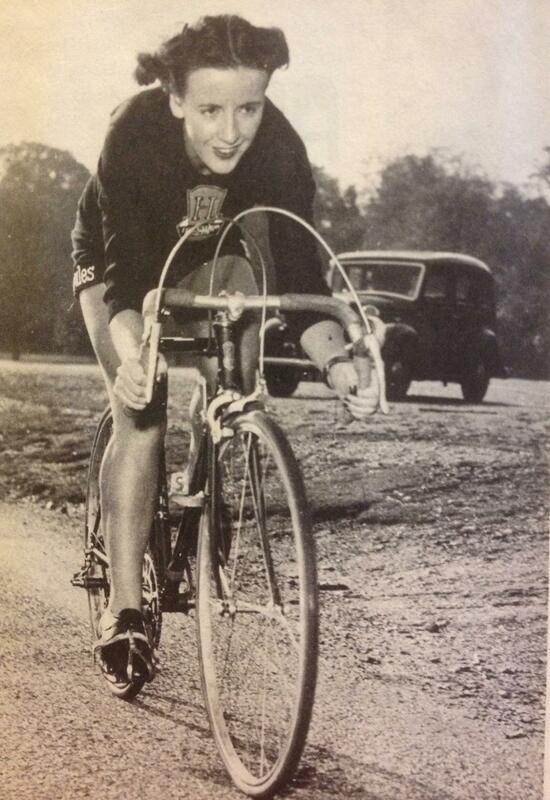 I recently wrote an article on Australian legend Ernie Old for Cycling History. There are so many great article on this blog that its a wonder that this article escaped my attention. I wanted to share Aaron Crisp’s well researched article about the biased attitudes that prevailed against women cycling. In time, as Aaron explains, women would come to enjoy the freedom of cycling unmolested. 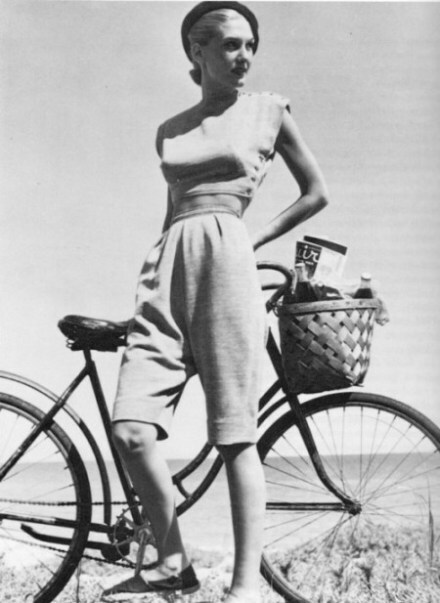 Sensibly women’s fashion also changed to suit riding a bicycle without being hindered. There is much more to this article, nonetheless I will leave it to my friend Aaron to explain. Enjoy. you come up with the most amazing stuff! Thanks Terry. I enjoyed writing this blog very much. Glad you liked it. All these pictures you have used are amazing. Cheers. I spent more time hunting down pictures for this blog than I did researching and writing it. Must admit I think it was worth the time invested. 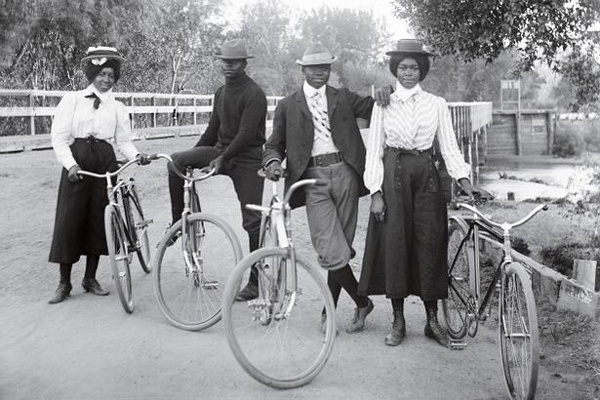 Can you send me a link to the origin of the photo captioned: “Four cyclists stop for a photograph on the Alameda Avenue Bridge, Denver, Colorado, circa 1905”. I’d like to get a high resolution image and permission to use it. Thank you. 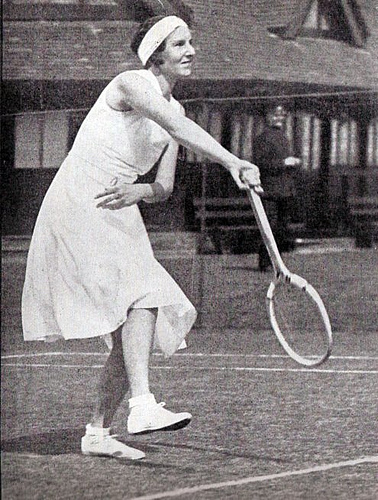 This entry was posted on January 30, 2015 by aaroncripps in Cycling, History, United Kingdom, United States, Women and Cycling and tagged Bloomers, Cycling, Cycling History, Cyclists Clothing, Nineteenth Century, Rational Dress, Twentieth Century, Women and Cycling, Women Cyclists, Women's Cycling, Women's Emancipation.